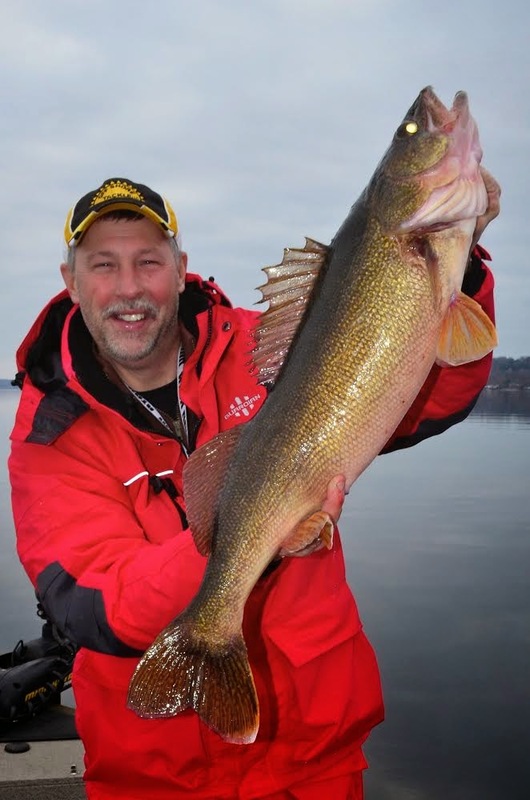 Walleye like these “eaters” can be trolled up in water as cold as 34 degrees! Troll slowly and carry a big stick: Fishing stick that is. That’s the advice I’d give anyone who is interested in learning more about trolling in extremely cold water. Here in the Great Lakes region we’re blessed to have open water somewhere just about year around. Even after the marina slips are void of boats, a wealth of open water trolling opportunities await Michigan anglers. 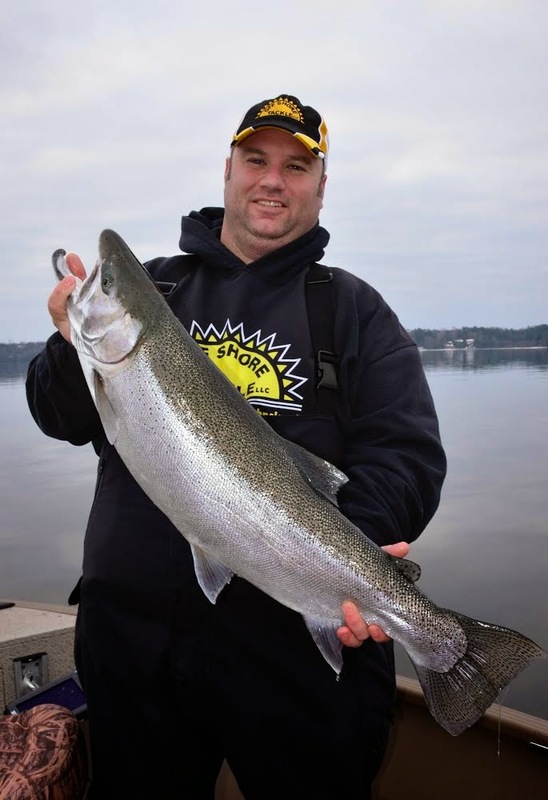 Late in the year and again early in the season Michigan has an abundance of cold water trolling opportunities for steelhead, salmon, walleye, trout and more. Trolling in cold water comes with a different set of “rules” compared to the popular trolling tactics practiced. As water temperatures drop, the activity level of fish also levels off, making it necessary to modify popular trolling tactics to compensate for fish that are less active and harder to tempt into striking. you know how to go about fishing in icy cold water. Before we venture into a discussion of how to troll in cold water, let’s identify what constitutes cold water. I personally identify cold water trolling as starting at about 50 degrees and pushing as cold as 34 to 36 degrees! Most species of fish are pretty active in 50 degree water, but when the temperature drops below 40 even cold water species like trout and salmon start getting lethargic. In the real estate business location plays large, but when it comes to cold water trolling location is only part of the puzzle. Being in the right spot is always important, but speed plays an increasingly larger role in fishing success once water temperatures dip below 50 degrees. Slower than normal trolling speeds are absolutely essential to triggering cold water fish into striking trolled lures. When fishing in cold water a trolling speed of 2.0 MPH could be considered blistering fast. Trolling speeds of 1.5 MPH or even as slow as 1.0 MPH are often required to get a strike response this late in the season. Trolling this slow presents a problem for some anglers. Most primary power outboard motors won’t troll slower than about 2.0 MPH. To get down below the 2.0 threshold requires incorporating an electric trolling motor or a small gasoline kicker motor. Of these popular “trolling motor” options, I personally favor using a bow mounted electric trolling motor. The model I favor has a auto-pilot function that allows me to control the boat with either the foot control or a key fob that I hang around my neck. The key fob makes it easy for me to make adjustments to speed or trolling direction from any location in the boat. Auto-pilot style electric motors also make it simple to maintain a trolling course without having to constantly steer the boat. Think of an auto-pilot electric motor is like having someone on board who is all time driver, freeing you up to set lines and manage the back of the boat! The auto-pilot electric motor market has been dominated by a single brand until recently. Now both Minn Kota and MotorGuide offer similar electric motors ideal for slow speed trolling applications. As handy as auto-pilot electric trolling motors are, they don’t work on all boat types. These motors are limited to a 60 inch shaft meaning they won’t function on deeper Great Lakes style trolling boats. In that case it’s best to use a small gasoline kicker motor for slow speed trolling applications. water and the majority were caught trolling crankbaits. 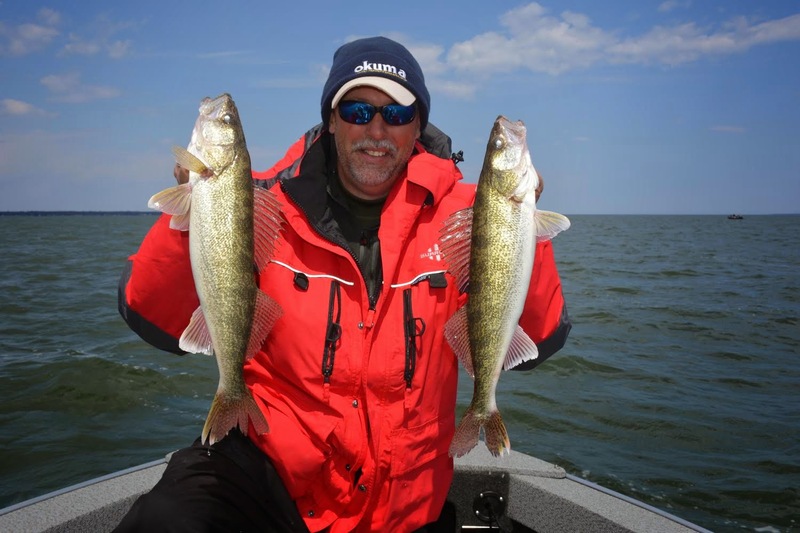 One problem associated with slow trolling is many of the popular lures used for catching trout, salmon and walleye simply don’t have good action at slow speed. Spoons are a prime example of a trolling lure that tend to have the best action at speeds of 2.0 MPH and faster. Certainly there are exceptions in that some spoon models fish pretty good down to 1.5 MPH, but in general spoons rank poorly as trolling lures for extremely cold water. Crankbaits are another problem area. The vast majority of crankbaits are designed to deliver a rather wide “side to side” wobbling action. In this case a wide wobble is too much of a good thing. High action baits just don’t produce well in cold water trolling situations most of the time and on most popular species. Instead, trolling in cold water calls for lures with a more subtle action. In the crankbait category, slender minnow style baits tend to have a less pronounced wobble and a seductive roll or rocking action that seems to trigger the maximum number of strikes when trolling in cold water. Every major manufacturer of crankbaits produces lures in this category, but some of the most popular models include the Rapala Deep Husky Jerk, Storm Jr. ThunderStick, Reef Runner 800 Series, Smithwick Deep Rattlin’ Rogue. Berkley Flicker Minnow series and Rebel Spoonbill. The jury certainly has mixed feelings about commercial scent products as they pertain to fishing, but most cold water anglers agree that scent seems to help trigger a few more strikes when trolling at super slow speeds. Scent can come in the form of live bait, cut bait, tipping with soft plastics or simply spraying or dipping a hard lure in a scent product. Applying scent may not cause cold water fish to literally jump in the boat, but it most certainly helps to a degree. Not long ago while filming an episode of Fishing 411 we were targeting brook trout in extremely cold water. My guest was Buzz Ramsey the trout and salmon fishing Guru. Buzz tipped his lures with pieces of scented soft plastic and I didn’t. I didn’t realize just how much the scent mattered until I finally was forced to follow suit and immediately started catching fish! When applying spray on or other liquid scent products, it’s best to re-apply about every 20-30 minutes while trolling. Scented soft plastics put out a good scent trail for an hour or more before needing to be replaced or recharged. trolling scene because they can be fished effectively at slow speeds. 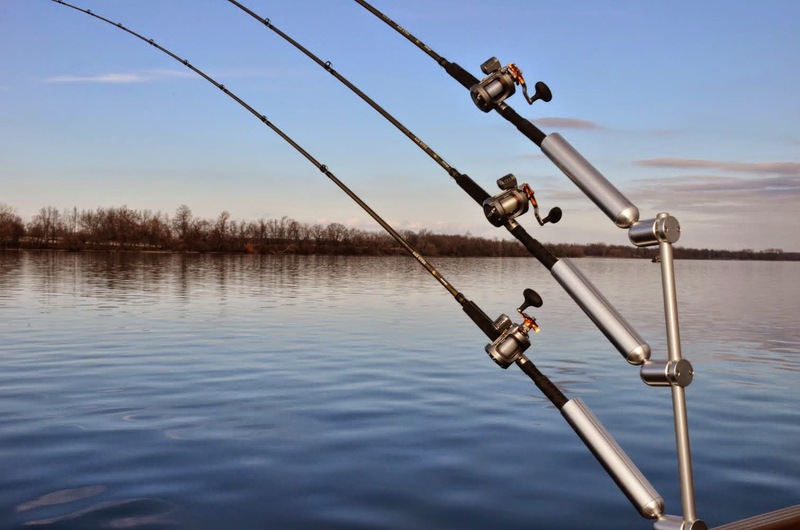 Systems are the author’s preferred rod holders for board fishing applications. Not always, but often cold water trolling is associated with very clear water. At this time of year plankton in the water is at an all time low and water clarity often improves dramatically. Using planer boards to spread out trolling lures and to present baits out away from the boat is a clear advantage. For slow trolling applications the most practical choice in planer boards are the in-line versions. Because these boards attach directly to the fishing line, trolling speed is not an issue. 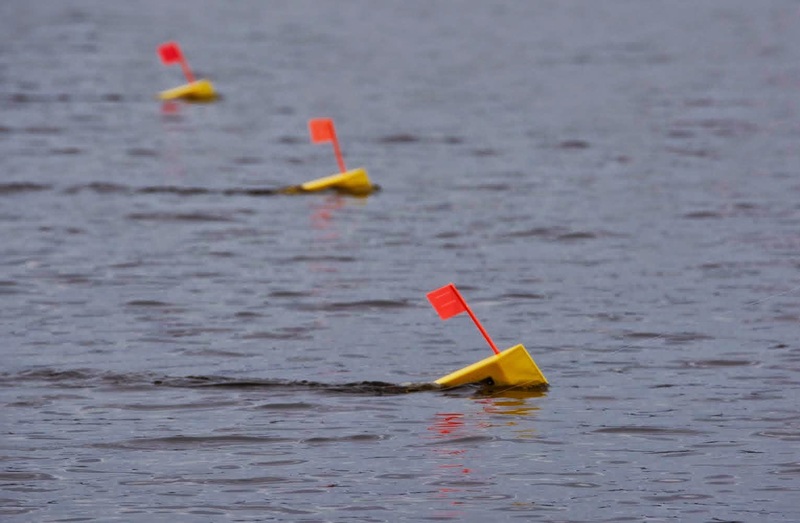 A mast style planer board system that requires the use of planer board line clips simply can’t deliver consistently crisp releases at the slower trolling speeds practiced in cold water. Late in the year trolling speeds certainly slow down, but fishing success doesn’t have to. By adapting to slower trolling speeds and lures that have good action at slow speeds, the Great Lakes angler can enjoy red hot action even when the weather isn’t.